Greek mayonnaise brings Mediterranean flavors to life with in this cucumber, mint and chicken combo. All the flavours are light and fresh perfect for the health minded dinner. A Recipe with low calories and even better if served on brown bread. Down load the recipe toady! Thoroughly combine in a blender Hellmann's Classic Mayonnaise, sour cream, feta cheese, olives and mint. Blend until smooth. Marinate chicken breast with Knorr Chicken Seasoning Powder andcorn oil for minimum 30min. Grill chicken and set aside to cool, before slicing. 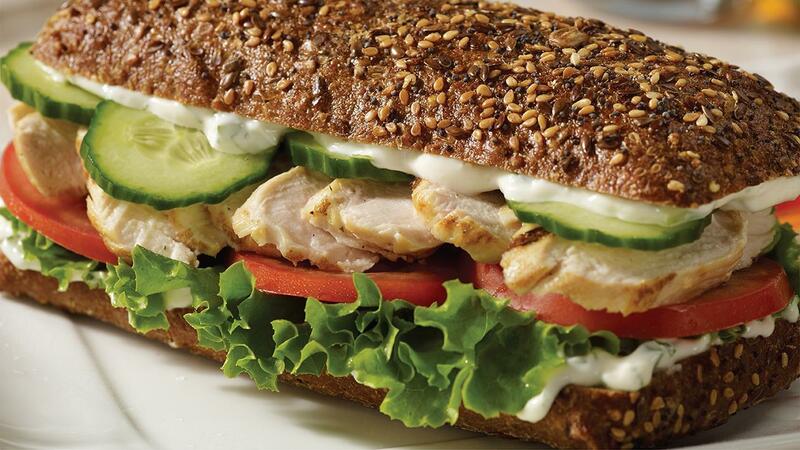 Spread the cut side of bread with lots Greek Mayonnaise. Layer bottom roll with lettuce, tomato, chicken and cucumber. Add more dressing at this stage before closing and slicing.